Beth Jacob Congregation was established in 1938 in response to the need for a Modern Orthodox synagogue in the Upper Park Heights community. Located on the corner of Park Heights and Manhattan Avenues, Beth Jacob served as the southern landmark of the Baltimore Jewish community as it migrated to the Baltimore suburbs in the middle of the 20th century. A building on Park Heights Avenue and Pinkney Road served as the congregation’s first home. The house at Manhattan Avenue which became the Sanctuary was purchased in 1940 and was used as such until 1953. A Hebrew School building was built next door. Dr. Louis L. Kaplan served as Beth Jacob’s first spiritual leader, followed by Rabbi Bernard Lander (1939-1944), Rabbi Paritzky (1944-1945) and Rabbi Uri Miller (1945-1972), under whose leadership the congregational membership increased from 200 to 600. 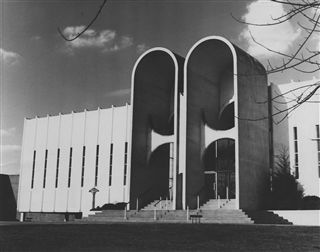 In 1953, Beth Jacob dedicated its first permanent edifice, and later expanded the synagogue in 1965. At that time, the house was converted into a gym for students. During the 1950s and 1960s, the congregation grew until it and its outstanding Hebrew school became one of the largest in Baltimore. The Hebrew school attracted 750 students and was led by Dr. Sidney Esterson. Rabbi Uri Miller also had the distinction of serving as President of the Synagogue Council of America. Rabbi Nahum Ben-Natan joined the congregation in 1972 to assist Rabbi Miller, and succeeded him following his death later that year. Rabbi Ronald Schwartz was appointed in 1984. Rabbi Gavriel Newman served the congregation from 1998 until the union with Beth Tfiloh in 2007. The Synagogue was also served by Cantors David Jacob and Ben Zion Weiss. In 1993, Ohr Knesseth Israel-Anshe Sphard Congregation (founded in 1887), also known as the Rogers Avenue Shul, merged with Beth Jacob, and the membership in 1994 exceeded 815 families. As a result of the union of these two illustrious congregations, approximately 300 former members of Beth Jacob Congregation became members of Beth Tfiloh Congregation, and Beth Tfiloh became the largest Modern Orthodox synagogue in the United States. The Beth Tfiloh Hebrew School was renamed the “Beth Jacob Hebrew School at Beth Tfiloh” to pay tribute to the outstanding reputation of the Beth Jacob Hebrew School. The original golden doors to the magnificent Beth Jacob Aron Kodesh and Ner Tamid have been preserved and are located here in this Beth Jacob Wing.